Just as I wish for any nasty gang, I want government to fail. To get so bad that no one complies any more. To spend its way into oblivion, and try to "tax" itself out of the box. To go overboard with everything it does. And, as if it cares about my wishes, government is doing so as fast as it possibly can. I would also be OK with it if government went so smoothly that I didn't notice it at all. 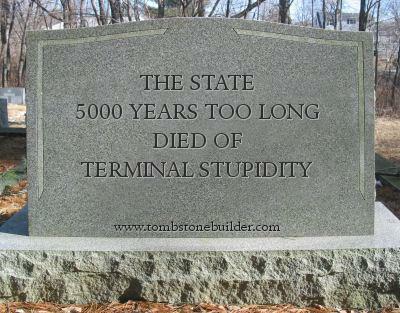 Yeah, death to the State is still better, but as long as it's not molesting me, I'm not going to go out of my way to notice it. But this isn't the nature of the thing. The more uncomfortable people become with government, the sooner they'll help it die. So, in spite of my own discomfort, I encourage government to be as evil and intrusive as it wants. Go all out. Governments always commit suicide, no matter who gets blamed by "history". I'll try to prepare for the worst, while hoping to avoid it.